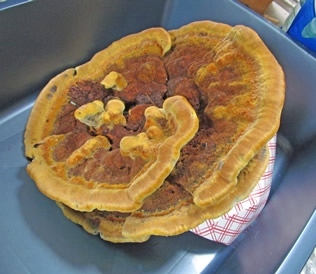 One of the best mushrooms for color is Phaeolus schweinitzii, "the dyer’s polypore". The best time to pick and dry this mushroom is when the outer growing edge is bright yellow, with yellow-green pores underneath. When cooked with alum-mordanted wool and a 1:1 ratio, the color will be a bright yellow or gold. Iron-mordanted wool will dye a consistent dark moss green with yellow tones and copper-mordanted wool will dye a rich chocolate brown. 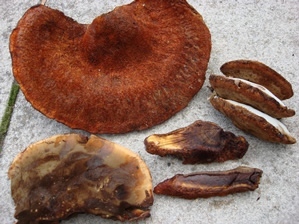 As the mushroom turns all brown with age, the color of the wool will be muddy looking or subdued. Using a 2:1 ratio of dried mushroom to weight of wool with young fruiting bodies or just the outer yellow edge it is easy to get 4 baths. A combination of an alum-mordanted skein with an iron-mordanted skein together will sometimes dye interesting yellow-greens on both skeins. 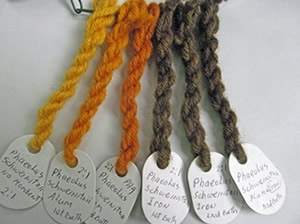 Phaeolus schweinitzii is a great mushroom for beginning dyers because it can be overcooked, undercooked, too little an amount or old pieces used, or rinsed out too soon, and still dye amazing colors. The old fruiting bodies, which are weak for dyeing, do not break down quickly in the woods so they may be found in fall or late spring. The observant hunter should come back to the same tree in early to mid-summer. Hapalopilus nidulans (rutilans in Europe and Canada) is a small annual wood rotting polypore on deciduous twigs and branches of birch, beech and oak. 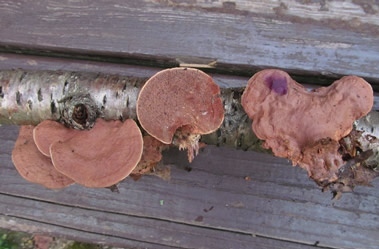 H. nidulans will dye a consistent shade of purple but must have the pH raised to 8-9 when the mushroom is first cooking or the color may not develop at all. 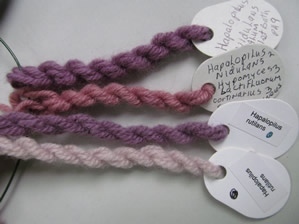 It is possible to get a good purple from only a few small pieces of dried mushroom or less than a 1:2 ratio of dry mushroom to wool using alum-mordanted wool. If enough is collected for a 1:1 ratio, the purple will be darker or more a plum color. 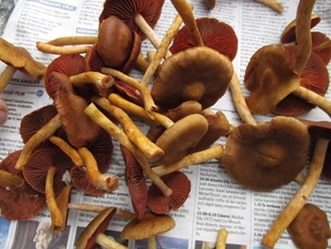 Only 1 or 2 baths may exhaust H. nidulans, but even if the bath looks at all cloudy combining it with a later bath of Cortinarius semisanguineus or C. sanguineus will possibly dye a dusty pink. This mushroom is like gold to mushroom dyers and sold recently in Scandinavia at the IFFS for an average of $15.00–$20.00 (US) for 20 grams or roughly ¾ ounce dried. It grows widely in northeastern North America all summer, but is often overlooked except by dyers. In Scandinavia it is more commonly found, sometimes having many pieces on one branch of either birch or Mountain ash. 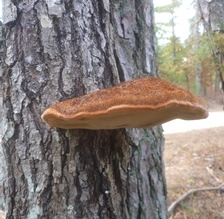 Inonotus hispidus is a large annual polypore found on several species of oak in eastern North America and is almost always found growing high up on the trunk of a living tree. It is best for color at mid-age when the fruiting body goes from yellow orange to deep burnt orange, it cuts like a hard cheese or beef tongue and the maggots inside the flesh are pink and 1/8 to ¼ inch long. The colors obtained when dyeing are very dependent on the age of the fruiting body when picked and the quantity used. A mid-aged piece will dye alum-mordanted wool strong burnt orange or iron-mordanted wool dark khaki green or brown with a 2:1 ratio of dry mushroom to wool and could go on for 8 baths. The young yellow fruiting bodies will dye very much like Phaeolus schweinitzii, that is, yellow with alum, and dark green with iron. The older black pieces will dye a weak poor color with any mordant. Most important with Inonotus hispidus is to raise the pH to 8-9 within the first 10 minutes of cooking the mushroom. It also helps to intensify the color of the dyed wool if the pH is adjusted to 8-9 at the beginning of each successive afterbath before the wool is put into the pot. 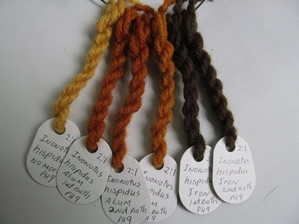 A full range of shades from deep burnt orange or red orange through golden orange and finally to yellow golds can be obtained from one dye pot using alum-mordanted wool. 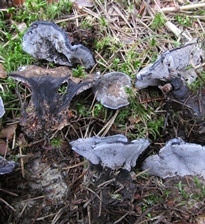 The fresh mushroom will appear to age as soon as it is picked becoming darker and blacker with handling. It is not commonly found in Quebec, New England or the Adirondacks. Oak species are more plentiful the further south one travels in eastern North America. It does not fruit until fall when evenings become cool and there is a lot of rain. Dominique Cardon records some historical use in North Africa in her book on Natural Dyes (page 531-532) and Inonotus hispidus is known to be used by the Spanish mushroom dyers near Barcelona, Spain (IFFS 2012). There are many species of tooth fungi or mushrooms having a spore-bearing underside of spines but sadly this group has not been seriously studied since Dr. Kenneth A. Harrison of Nova Scotia passed away in 1991. 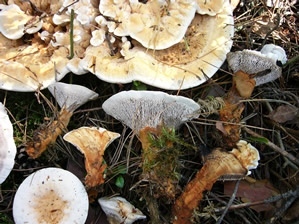 The 3 genera of Hydnellum, Phellodon and Sarcodon in the Thelephoraceae family of fungi can produce teals, blue-greens, greens and grays. This group is temperamental to get any color from at all. Careful attention must be paid to the temperature of the dye bath (never a boil) and to raising the pH to 8-9 within the first 10 minutes of cooking the mushrooms. 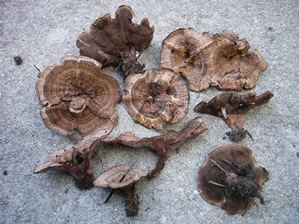 The pigment is strongest in the mature fruiting bodies, not the young ones, but it still may be necessary to double or triple the ratio of dried mushroom to wool for a good blue-green or blue-black color. Each species varies in amount of pigments with some being better than others and each dyeing slightly different from the next under the same conditions. Hydnellum and Phellodon grow indeterminately, which means they will surround the moss and pine needles of their habitat, allowing them to hold water sometimes for several weeks while they mature. It is well worth the effort to remove as much debris as possible when picking. These mushrooms dry easily whole or cut in half lengthwise in a well ventilated area, and then can be stored dry in tight sealing plastic bags for use at another time. Hydnellum aurantiacum looks like a creamsicle (orange ice Popsicle) when very young. 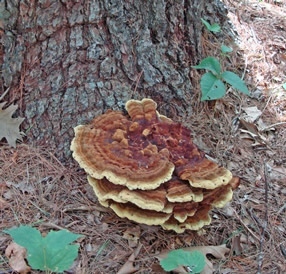 It is best to wait till the fruiting bodies are mature and brownish orange before picking. 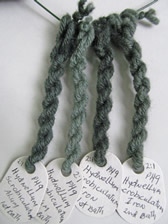 A 2:1 ratio dyes consistent shades of greens with alum-mordanted wool for at least 2 baths in distilled water. 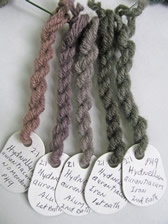 If the water has some unknown minerals or chemicals, the color will be gray-green with the same alum-mordanted wool. 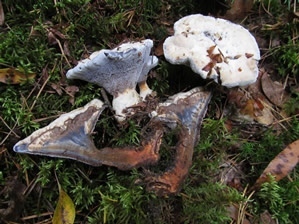 Hydnellum caeruleum can look identical to H. aurantiacum when mid age to mature, but always has a bluish look to the outer growing edge on the young fruiting body. When cut in half lengthwise the stem will be orange at the base but will have alternating layers or zones of white, blue and orange. The best blues may be obtained with alum- or tin- (not recommended, because of its toxicity) mordanted wool if you are careful and use a 2:1 ratio or more of mature fruiting bodies. Hydnellum scrobiculatum/concrescens is a confusing complex with little to distinguish between them in either macroscopic or microscopic features. The mushroom is brown all over, the dye bath is red but the alum-mordanted wool will dye blue-green or teal with patience and careful attention to details. Hydnellum spongiosipes is another brown species with spines or teeth, and a brown spore print, and is most often found in deciduous woods of oak and beech. H. spongiosipes is another good dyer for teal or blue-green using alum-mordanted wool and a 1:1 ratio if the fruiting bodies are mature. Phellodon alboniger/niger is another complex of two species that are difficult to distinguish from each other. They grow with conifers in the northeastern United States, one fruiting body often developing over a period of 2-4 weeks. They are gray or blackish on top, may be surrounded by deep moss but on picking reveal tiny white spines on the underside. 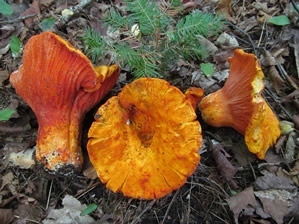 Cortinarius semisanguineus in the subgenus Dermocybe is an excellent source of red and orange pigments. The red pigment is concentrated in the caps and the more mature the cap, the redder the pigment. 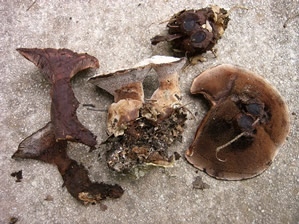 For this reason, it is a good practice to sort the fruiting bodies for drying by separating the caps from the stems and young ones. Stems and young ones are a good source for orange so should be saved. C. semisanguineus has the most consistent and interesting dye properties. In the dye pot a 1:1 ratio is good for red but a good red may still be obtained with a ¾:1 ratio or less of the mushroom to the alum-mordanted wool. If the caps are very mature, each bath will be redder than if the caps were immature using the same amount of mushroom. In a normal 1:1 ratio with alum-mordanted wool the first bath will be the strongest red, the second bath will be a good strong orange and the third bath will be a lighter orange or more flesh colored. 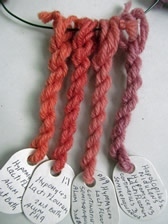 It is also possible to vary the redness by raising the pH to 8-9 for a rosy, less orange red or by lowering the pH to 4-5 for a more red-orange on alum-mordanted wool. This is a useful trick to know when dyeing wool for a project where colors need to look well together. Use distilled or previously tested water, as chemical additives will adversely affect the reds obtained. 1 ounce dried of C. semisanguineus could be as many as 40-50 mushrooms so an abundant fruiting is well worth the time and effort to collect and dry. Even the "sploges" or rotting red blobs found while collecting can be cooked up quickly or frozen in distilled water for future use. Cortinarius sanguineus also in the subgenus Dermocybe can be an even better source of red pigments. The Scandinavian dyers are able to collect large quantities of C. sanguineus so are able to use a lot of red in their projects and have enough to sell to us jealous North American dyers. It may grow commonly with spruce or at elevation in the late summer or early fall, but either no dyer has been there to pick it or no one has reported it if they did find it. 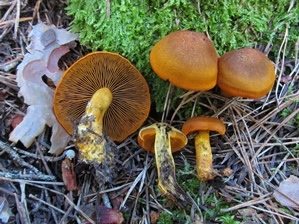 Any Cortinarius-Dermocybe with bright yellow or orange gills will have some pigments for dyeing. Since this group is difficult to identify it may not be possible to put a name on the species found. One exception is Cortinarius malicorius which is common in lower Quebec in conifer woods and is well known as a good dyer in Scandinavia. It looks somewhat greenish yellow inside when cut in half lengthwise and dyes good orange-yellows with alum-mordanted wool. Leftover dye baths of any Cortinarius-Dermocybe can be combined with other species of mushrooms that dye well with alum for interesting results and sometimes improved results. 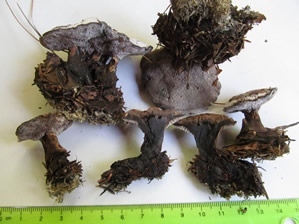 The best pairing as mentioned previously is a combination of Cortinarius sanguineus or C. semisanguineus and Hapalopilus nidulans for a dusty pink. Pink is a difficult color to get with fungi. 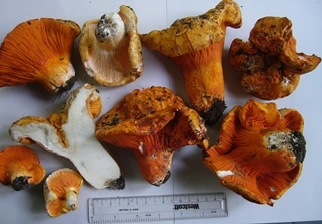 Combining either Cortinarius semisanguineus or C. sanguineus with Hypomyces lactifluorum, the lobster mushroom, can also produce interesting pinks, corals and oranges. 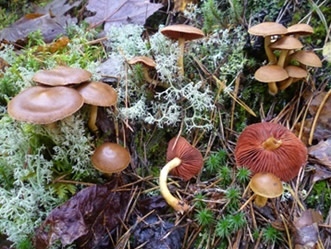 The shade or value of the resulting color is dependent on the ratio of the mushrooms to each other as well as the age at which each was picked and the amount of alum-mordanted wool used. This means that the resulting pink is different every time and is hard to repeat.